Cave Creek, Arizona is a remarkable community found a short drive north of Scottsdale. Surrounded by majestic granite boulders and lush desert, Cave Creek is a great place to live away from the hustle and bustle of urban and suburban life. The mountain views enjoyed by residents of Cave Creek are almost as impressive as the midnight-black night skies dotted with millions of twinkling stars. Carefree’s western neighbor, Cave Creek, Arizona has a long rich history. Once a mining and ranching town, Cave Creek is home to impressive real estate options in Maricopa County. While there are exceptions, most Cave Creek properties have horse privileges, desert trails and are conducive for a country ranch lifestyle. Just north of Cave Creek you’ll find the 2.9 million acre Tonto National Forest and abundant recreational opportunities. Cave Creek, along with its sister-city Carefree, also have abundant shopping, dining, and entertainment opportunities. Cave Creek is home to around 5,000 residents in the beautiful Sonoran Desert. Comprised of 28.2 square miles, Cave Creek shares the local landmark Black Mountain with Carefree. Condos and townhomes in Cave Creek have an average listing price around $280,000, but can be as high as $675,000. 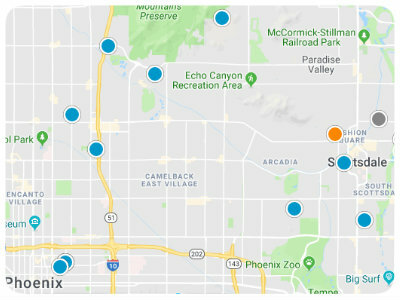 The average listing price for a single family home in Cave Creek is around $730,000, but some luxury estates and acreages can come with price tags near $7 million. If you would more information regarding homes for sale in Cave Creek, Arizona, please do not hesitate to contact us today.